Bob has been an auctioneer for over 20 years. He has held 1,000’s of auctions, and now has his son and daughter (both auctioneers) working with him. Bob has had live auction crowds ranging from only a few bidders to over 1,000 bidders. The variety of items (property) being offered. For example, a pottery-only auction might only attract 35 bidders, where an auction with pottery, silver, china, furniture, guns, jewelry and other items might attract several hundred. The overall demand for the items being offered. For example, if Bob was selling 150 guns, he would expect a large crowd due to the wide and strong interest in guns. However, if he was selling 150 vintage ice cream scoops, he would expect a smaller crowd as there is only a modest number of people interested in vintage ice cream scoops. I suppose this old axiom still holds some truth, but in this age of auctions being listed on a variety of Internet auction calendars, and the Internet being all around us, available 24/7, then one must conclude that people do know about auctions. If that’s true, then the other reason would be the only reason left — that there is a lack of interest? Some auctioneers have said, “I had over 10,000 views on AuctionZip.com and yet I had a small crowd … I just can’t understand it.” Does someone viewing an auction on the Internet translate into their attendance and/or participation? Not necessarily. 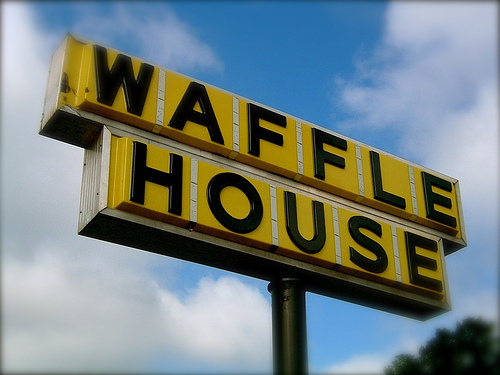 Take a look at the Waffle House sign above. Would it be impossible to believe that this sign was seen by over 9,000 people every hour every day? Further, would it be impossible to believe this restaurant closed due to lack of customers? Just because 216,000 people saw this sign every day doesn’t mean they want to eat at this establishment. Seeing the sign is only recognizing the invitation to eat there — which can be accepted or rejected. Similarly, over 10,000 people can view an auction on an Internet auction calendar, but only 17 of those 10,000 can accept the invitation (see the auction worthy of their participation) and attend. In this example, over 9,983 people viewed the auction and decided against attending — maybe they attended another auction, went fishing that day or just stayed home? Lastly, there is the theory of comparison. Bob’s annual farm equipment auction had over 900 bidders last May, but only 400 this year. Bob noted that there were two other large farm equipment auctions on the same day this year, where last year there were none. Did some of those other 500 bidders go to one of the two other auctions? Maybe so. Auctioneers have bidders accept their invitations to participate based upon how that invitation reads, and I suppose how many other invitations they received for that same day — for auctions, or otherwise. It’s important to remember it’s not the number of auction invitations that are “opened” but rather how many are accepted.